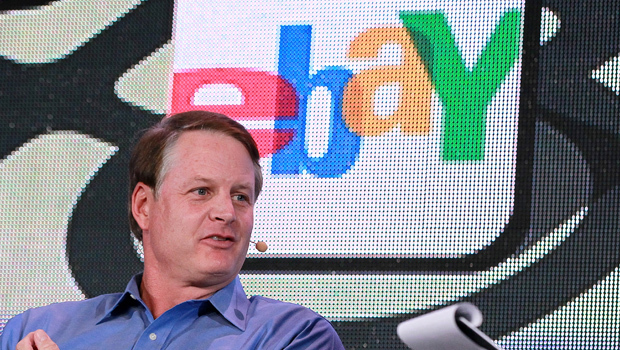 NEW YORK EBay (EBAY) CEO John Donahoe's compensation nearly doubled to $29.7 million in 2012, a year that saw the e-commerce company's stock gain 68 percent thanks to growth in its namesake marketplaces business and PayPal. Donahoe's compensation was valued at $16.5 million in 2011, according to a filing with the Securities and Exchange Commission on Monday. His salary grew about 3 percent to $970,353. The bulk of the increase came from stock awards amounting to $23.7 million last year, up from $8.9 million in 2011. He got an incentive payment of $2.8 million and options worth $2 million. EBay has been trying to expand PayPal, still largely an online payments service, into brick-and-mortar retailers. Stronger-than-expected results in the final quarter of the year topped the biggest year ever for the company.